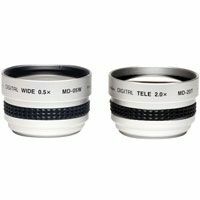 The two-lens set from Kenko is made up of the MD-05W, a 0.5x wide-angle lens and MD-20T, a 2.0x telephoto lens. The two lenses have a 37 mm mount thread and also contain step rings for 30.5 mm and 30 mm to mount on many Mini DV camcorders from Canon and Sony and other manufacturers. These lenses have silver finished aluminum barrels and high quality glass optics that are coated to guard against reflections and flare. This set should be of special interest to first time Mini-DV camcorder buyers because the wide-angle lens allows you to double, get twice as much in the picture, the camera's original wide angle ability. The telephoto lens makes it possible to get twice as close to a subject without having to use the camera's Digital Zoom feature. The Digital Zoom increases magnification by increasing the size of each pixel in the frame, creating a pixilated image that is far less sharp than the optical zoom.